Woody Allen said he has written all of his scripts and The New Yorker pieces on a typewriter. That’s 60 years. And it worked for him just fine. 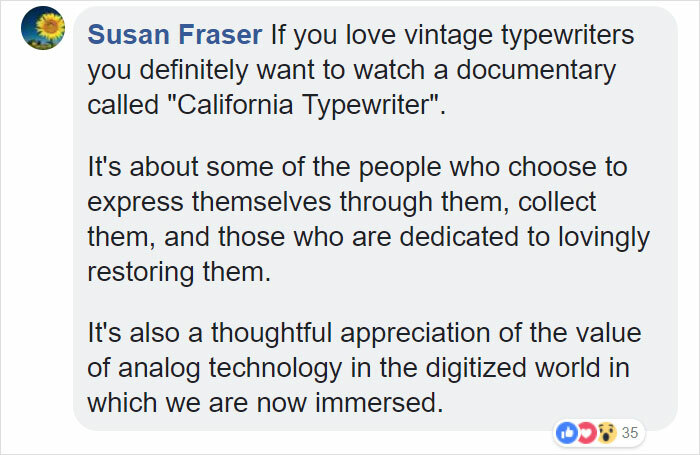 In fact, typewriters are making sort of a comeback today. 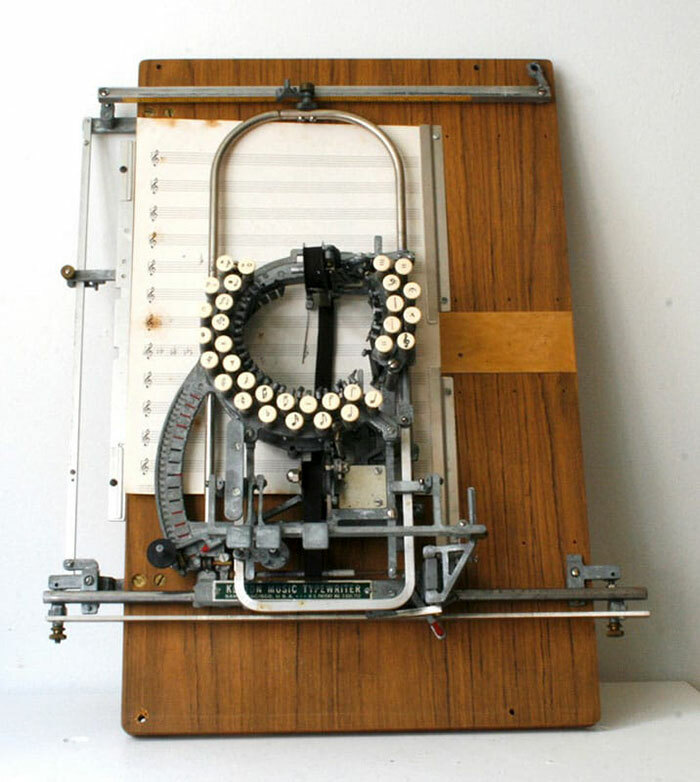 And arguably one of the most desired ones is the Keaton Music Typewriter. And for an interesting reason. 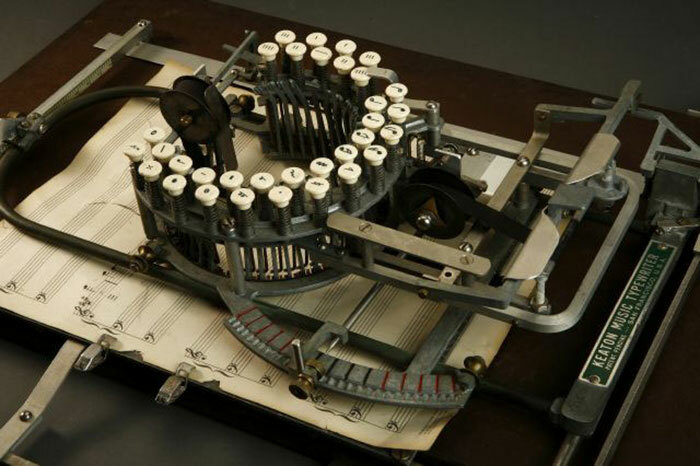 First patented in 1936, it was designed and produced to hammer out musical notations, not letters or numbers. 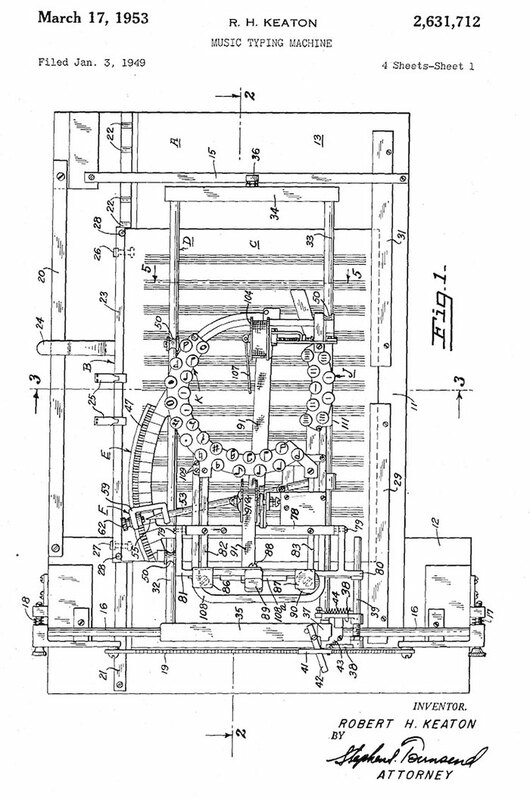 The original patent was for a 14-key typewriter, which was updated to 33 keys and greatly improved in the 1953 patent. Marketed in the 1950s, it sold for about $255 (about $2,415 in today’s money). 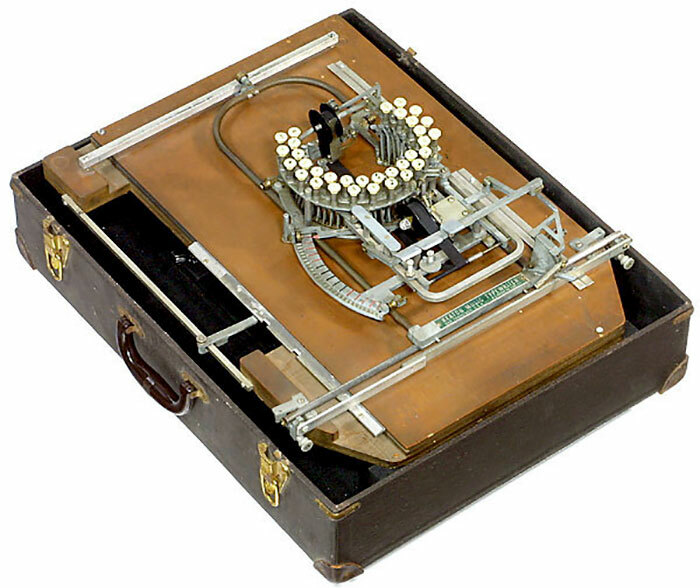 Keaton was trying to create something that would print characters precisely on staff and indicate exactly where the next character would be printed to ensure accuracy, and ended up with a circular keyboard which gives the typewriter its distinct look. 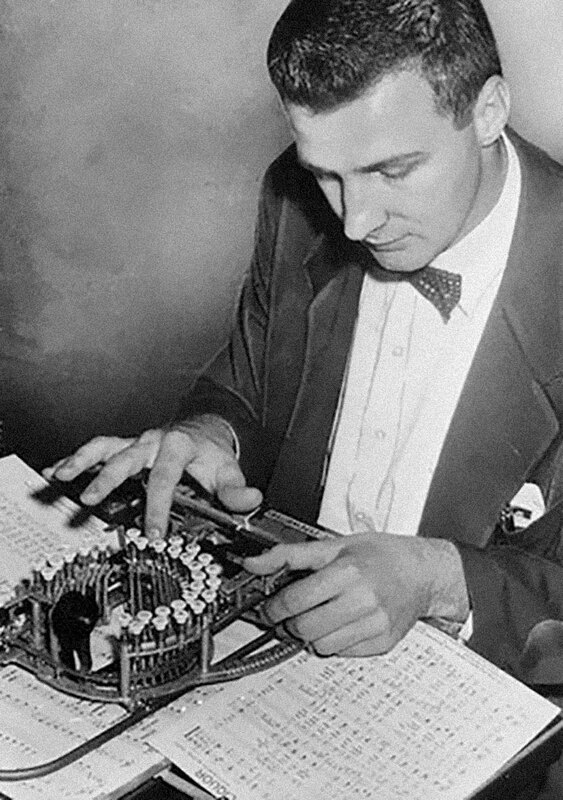 “One keyboard is adapted to type one class of music characters such as bar lines and ledger lines, which, when repeated, always appear in the same relative spaced positions with respect to the [staff] lines… and a second keyboard adapted to type another class of musical characters, such as the notes, rest signs and sharp and flat signs etc., which may, when repeated, appear in various spaced positions with respect to the [staff] lines,” Keaton wrote. 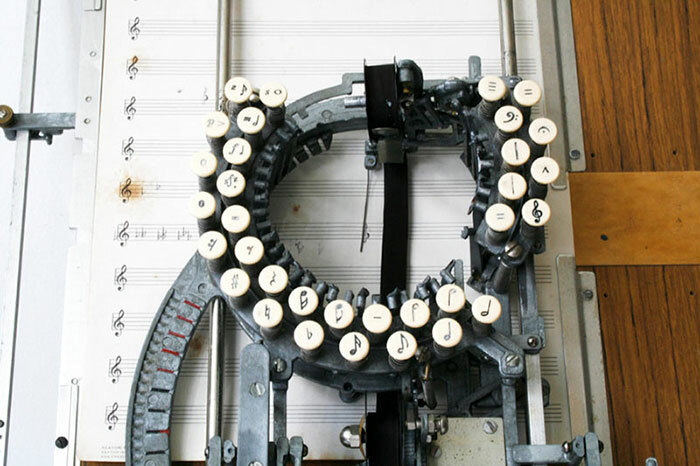 Users of the device control where the notes and characters fall on the page with the help of the curved meter on the left that Keaton called the Scale Shift Handle and Scale Shift Indicator. By moving the handle up or down a notch, they tell the typewriter how much to adjust, printing 1/24 of an inch in either direction. Moving one notch up or down will cause the character to fall one musical step either way. To make sure that whoever was using the typewriter could see where they were about to print, Keaton included a long needle next to the ribbon that leaves nothing up to chance. Interestingly, the two keyboards work in different ways with the Scale Shift Handle. The larger keyboard with the notes, scales, sharps, and flats moves freely in tandem with the Scale Shift Handle. The smaller keyboard (which contains items like bar lines and ledger lines) stays in place since its characters always appear in the same place with respect to the staff lines. The end result, unlike handwritten manuscripts, was supposed to be of publishable quality. Reportedly, it made it easier for publishers, educators, and other musicians to produce music copies in quantity. 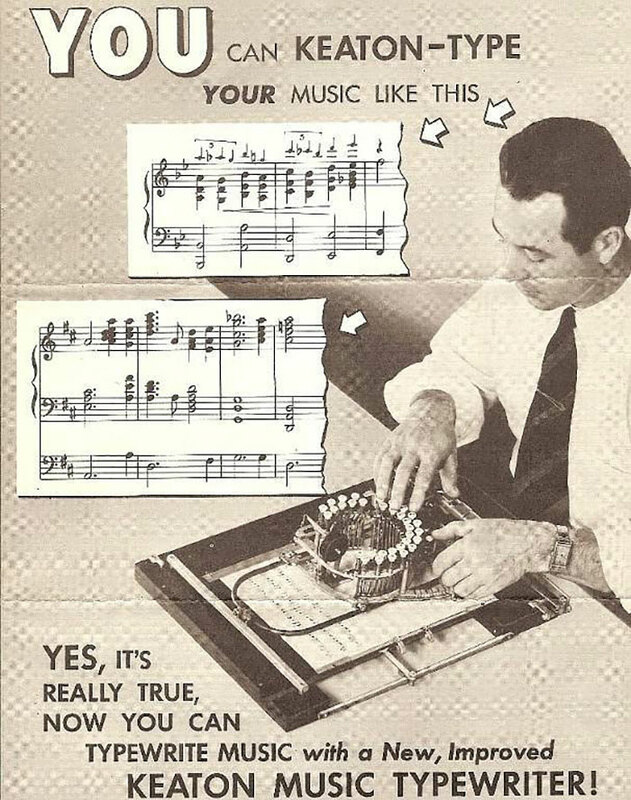 Composers, on the other hand, still preferred to write their music out by hand. However, due to its incredibly thin niche, we can’t know for certain if the product was a commercial success or a bust. 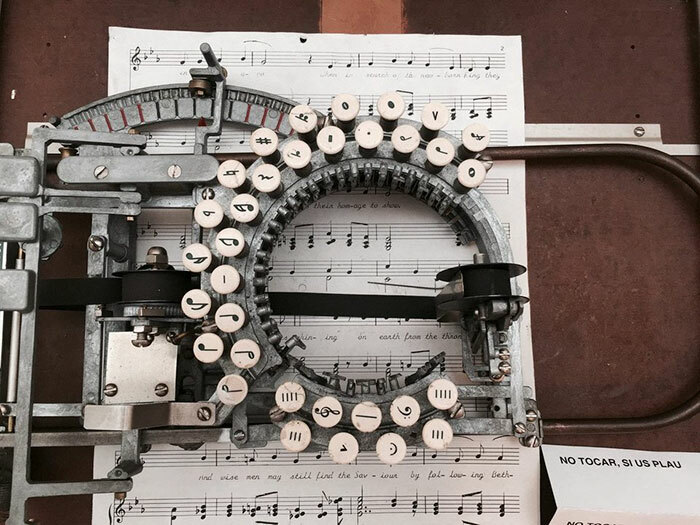 But its originality has made the Keaton Music Typewriter a desired collectible. Although it is thought that only about a dozen of them remain in working condition, sometimes they can found on online auctions selling for around $6,000-$12,000.